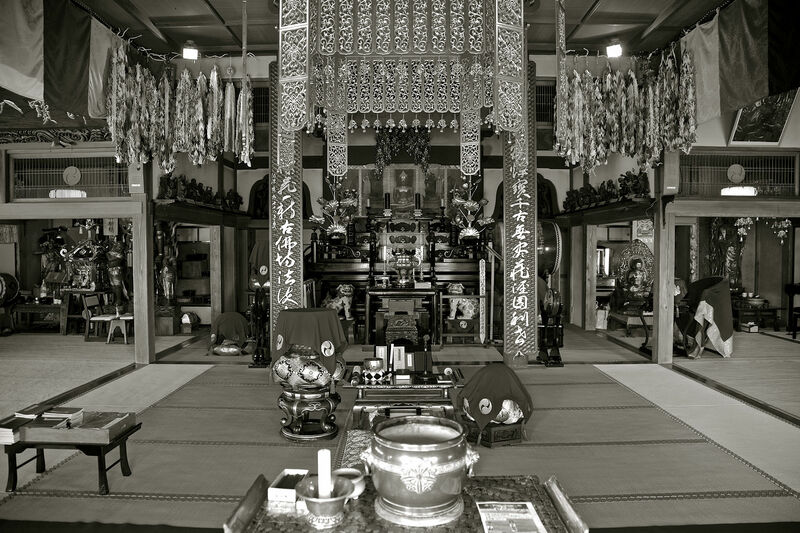 A Soto Zen School Buddhist temple, Dogenin Temple is located on a hill overlooking the Sant Juan Bautista Park, the Ishinomaki Bay and the Watanoha town. Dogenin Cemetery and the accompanying pet cemetery comprise part of the temple grounds. When the big shaking motions struck at 2:46 pm, March 11, 2011, Dogenin abbot Shutsu Onosaki knew intuitively that a great many people will come to the temple seeking shelter. Noticing he didn't have any spare batteries for the radio, he called out to his daughter Mayumi, "Go get some batteries from the convenience store!" Mayumi had just woken up from resting after a night shift at the neighborhood nursing home. The importance of keeping a radio handy in case of emergency was something she had heard her father mention every once in a while, so she took off in her car right away. In the meantime, some people came running to the temple just ten minutes after the earthquake started. By late afternoon, some two hundred people were there including those who were soaking wet from the waves. Regardless of affiliation, anybody who knew the safety of the high ground where the temple stood came. The meeting hall as well as the main hall of the temple filled up with people in no time. The number of the evacuees had increased to three hundred by the second day, but there was no sign of Mayumi—she hadn't returned after she went out to buy batteries. I had driven her to death —abbot Onosaki was taken up with this remorse as he went about the work of looking after the needs of the evacuees. It could have been that he was trying not to face the reality, trying not to face up to her absence. Getting kerosene heaters in order, securing rice, water or the temporary lavatories—there was one thing after another that he had to do, but still he couldn't help but think of Mayumi. Whenever there was any time, he would go down the hill to look for Mayumi's car, crying as he did so. There were piles of cars one on top of another, but Mayumi's car wasn't there. He prepared himself to face her death. On the morning of the third day, Mayumi returned home, her body soaking wet up to her chest. 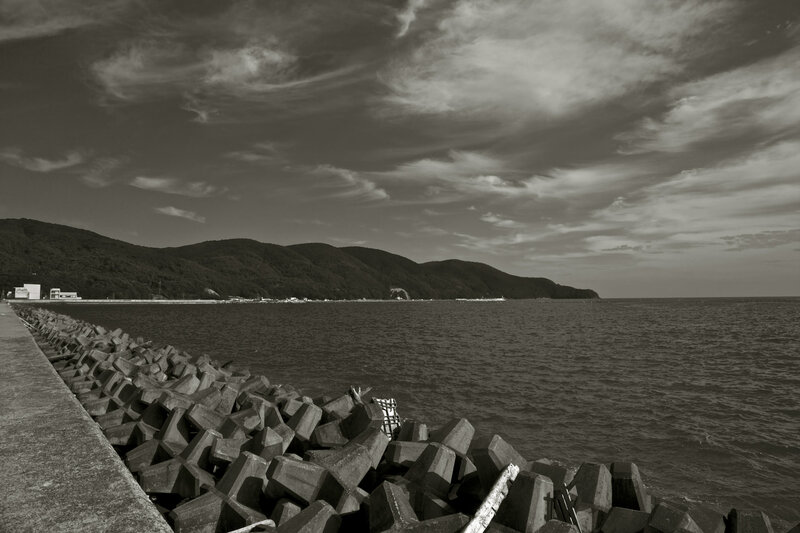 Since the neighborhood convenience store had run out of batteries, Mayumi had gone across the bridge toward the railway station. By the time she bought the batteries, the tsunami was almost there. As she was driving, she could see the wall of black wave coming to assault her. Even though she thought "This is the end!" she tried desperately to get away. She doesn't remember how she managed it, but the next thing she knew she had landed on a land bridge and had come to a stop. It was flooded all around, and she couldn't go outside of her car. She spent two days in it, but on the third day she decided to brave the waters to get back home, going over the rubble which stood in her way. These few days the father and daughter both faced death indeed. The radio at that time was reporting five thousand people as dead or missing. Dogenin Temple had always maintained strong ties with the community through various functions including providing Sunday school or accommodating high school students for retreat programs. Temple functions often necessitate the preparation of meals, and to make this possible, a large kitchen is always ready with stoves, big pots and abundance of plates and utensils. There was little that stood in the way of opening up the temple facilities for an emergency shelter. The power outage prevented the rice that was in stock from being polished, but warm porridge of unmilled rice was more than what people could ask for. Fire ban was in force at other shelters. While there was sufficient food for all the people taking shelter, not enough space was available for everybody to lie down to sleep. They had to lean against one another when resting. Health and sanitation needs had to be met as well as the need to obtain water from a source six kilometers away. In view of the situation, abbot Onosaki decided to have certain individuals be in charge of different tasks that needed to be done. Meetings were held every morning and evening, where the updates on the status were shared and ideas were heard about what they needed to get, and what must be done. Afraid that lying around too much would lead to inertia, Onosaki started to have the evacuees do the radio exercise program. Come April, devotion time started to be observed in the main hall. Those who were sleeping in the main hall followed the abbot joining both hands in prayer and reading the sutras. All the 25 kids who were there learned the sutras by heart, joining the adults chanting them loud and clear. Many of them were heard saying, "Chanting sutras helps you feel pure and refreshed." The atmosphere at the temple-turned shelter was congenial, a result likely coming from the willingness on the part of both the temple and the surrounding community to deal with the shelter life together as one. Many of the volunteers who came to deliver relief supplies were surprised to see this, saying "It's hard to believe this is a shelter. Everybody seems to have a positive expression." Not a few of the people taking shelter had lost their loved ones. One man lost his wife when they were running away from the tsunami together, holding her hand in his. But when they were overtaken by the tsunami, he inadvertently let go of her hand. "I've lost my home, my wife, everything. There's nothing to live for anymore." Being in the depths of despair, he said, "She doesn't need a Buddhist afterlife name. There's no need for her funeral." Miki, the abbot's wife, encouraged him saying, "You've got to hang in there—otherwise your wife won't be able to find mercy. You hold up with this now, and that's going to be the source of her happiness." When the man said he had no idea how to go about praying for the souls of the dead, she urged him saying, "Before the morning devotion every morning, you set tea and water by the memorial tablets of those who passed away and join your hands together in prayer." Since then, he continued doing this every morning and, by and by, he was finding different chores to do around the place. One day, he came over to the abbot to ask, "I want to give a funeral for my wife with all the people in this shelter partaking in it." The funeral was given, and when it was over, he thanked the abbot for the good funeral and shared his feeling saying, "I think I found a foundation for the rest of my life now." Guiding the deceased to follow the path to Buddha and assisting the bereaved in finding an emotional closure for the sake of continuing with the rest of life—these are what a funeral is for, according to abbot Onosaki. "Through the devotion that's given every seven days, we see to it that the dead will be delivered to the world of Buddha peacefully and that the bereaved will be gradually unleashed from the pain of loss. What we observe on the so-called 49th day after death is one way that marks this change of stage." Through living a shelter life at Dogenin Temple, people had many encounters and faced realities squarely. It seems that people learn to live a strong and positive life by dealing firmly with reality as it presents itself in the harshest of conditions. Since our temple stood on a hill, it filled up quickly with people seeking shelter, drawing over 400 people by the third day after the disaster occurred, using up all the space there was. I thought first of the safety of the area residents who would be rushing to the temple, and so I quickly went about the task of clearing the main hall of all the things that were scattered including the broken images of Buddha, altar fittings and incense burners with all the ashes. I had to get the place ready to receive all the people. During the five months of maintaining shelter at Dogenin Temple, the evacuees managed to sustain themselves and were able to go on to the next stage of life ahead—moving into the temporary housing units after the shelter’s closing ceremony on August 7. Everybody joined their knowledge and effort together to make things work. During the first week after the earthquake, the entire area isolated with no relief supplies getting there, the evacuees managed to cope with the hunger and the cold by making the best use out of what was available at the temple. All the knowledge and skills that were utilized under these extraordinary circumstances were singularly amazing. Uncertain as to how long the shelter life would continue, the evacuees agreed to abide by the eight rules that were set up so that they could support one another. Under those rules, meetings were held after breakfast everyday where the spirit of mutual support was strengthened. When the relief supplies and volunteers arrived eventually, smiles started to appear on the faces of the people, and along with the cheerful spirit shown by the children of the shelter, an upbeat atmosphere gradually came to prevail. Shelter life at the temple gave the evacuees an opportunity to join the abbot in the morning devotion on a daily basis, where the mercy and grace of Buddha allowed them to be at ease, albeit for a brief while, and this was conducive to nurturing a sense of comfort amidst the otherwise adversary circumstances.